The eighth Fashion Redux Finale Party was presented by San Diego Mesa College School of Fashion at the San Diego History Center on March 8. Each year, a date is picked and fashion students visit the history center’s textile collection. This year, a few 1960s garments were brought up from the archives for the students to study. Using these garments as inspiration, they’re tasked with reinterpreting the past look and creating a modern design. The evening began with a reception in the atrium. The 1960 garments were on display for all to view. All the garments were evaluated by a panel of judges, who are professionals in the field of fashion. The top four garments were submitted for the evening. Models strolled through the crowd wearing them for all to see. This gave everyone the opportunity to vote for the People’s Choice Award. This year, Divya Sharma won this coveted honor. 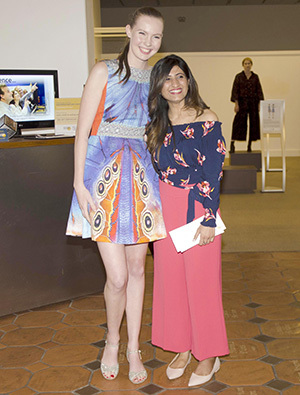 Sharma also won the Most Innovative Award for a design inspired by the multi-colored ’60s dress in the archives. She created the dress by making her own textile print and using her own motifs. The dress was topped off with Swarovski crystals accenting the neckline and waistline. Melanie Cox won for the Most Wearable Garment. This was inspired by a two-piece skirt and jacket suit from a collection in the archives. She used a black and white herringbone pattern that was finished off by teal piping. Lorena Silva was rewarded with the Most Creative prize. Silva made handmade faux chenille fabric on a collared jacket and a pleated pair of pants. Her inspiration was by the works of textile artist Tim Harding. Jessica Holland was awarded the Best Translation of the ’60s theme. Using the 1960s party dress from the collection in the history center, Holland created a trapeze-like fit with long bell sleeves. Everyone was encouraged to wear 1960s dress and many of the guests arrived wearing their best interpretation of this era. The Fashion Club gave an award for the best ’60s costume in the audience. Luz Arreola was the recipient of this prestigious award. After the award ceremony, all guests adjourned to the auditorium for a lecture on the 1960s by professor and fashion expert, Susan Lazear. Lazear took us down memory lane and said this was the time of war and rebellion, which created an anti-cultural movement. Fashion reflected that movement of the time with short hems and mini-skirts. The silhouette was a rectangular shape. One popular look was A-line dresses with empire waists. Big bold graphics were in style by designers such as Pucci, Mary Quant, and Mondrian. If you missed this fun and educational evening, stay tuned for next year. Can you guess what will be the theme? For more information and exhibits, visit sandiegohistorycenter.org or sdmesa.com for details about the fashion program at Mesa College. April 6 – Fashion with a Passion presented at FIDM on 350 10th Ave. #300 from 11 a.m.-3 p.m. There will be raffles, ultimate swap, and a designer fashion show. Benefits the Make-A-Wish Foundation of San Diego. For more information, visit fashionwithapassion.org. May 11-12 – USA Lifestyle Show will be in Hall E at the San Diego Convention Center from 9 a.m. -6 p.m. Beauty, fashion, cosmetics, and apparel will be some of the features at this expo. For more information, visit visitsandiego.com. — Diana Cavagnaro is an internationally renowned couture milliner based in the historic Gaslamp Quarter. Learn more about our hat designer, teacher and blogger at www.DianaCavagnaro.com.